Somehow in my mind, sausages and the color purple never seemed to go together. The movie - The Color Purple (starring Oprah Winfrey and Whoopie Goldberg)... maybe. I could see myself enjoying sausage with that. But the actual color purple wrapped around meat? When I first saw this product in the freezer isle, I had to smile. On the package little sausage links are wrapped in a shocking purple-ish blue pancake batter coating. Imagine wrapping bacon in something neon green. It was daring. When you bring this product home and prepare it (60 seconds in the microwave), the shocking color isn't really there. The color of the coating is more like a standard buttermilk pancake with specs of blueberry. It actually looks more appetizing in reality, but the novelty of the dramatic color differential from the package is lost. Having bought this product for the novelty, I was a little dismayed. The good news is that this product tastes pretty good. It's what you might expect... a quality sausage wrapped in a blueberry pancake. From the packaging, I was expecting some kind of super blueberry pancake... but I liked it all the same. The flavor had a homespun quality as if you were wrapping sausages at home or in a diner. The whole idea of having appetizers or finger foods for breakfast was a nice change of pace. 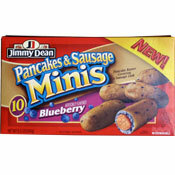 I'm going to recommend that people try Jimmy Dean Pancakes & Sausage Minis (Blueberry) one time. There's something fun about them. They won't blow you away and I doubt you'll buy them again, but I think you'll like them while you have them. Sadly, each serving of 3 bite-sized pieces has 6 grams of saturated fat. That's another reason to try them only once. Other nutritional considerations: each serving contains 260 calories, 18 grams of total fat, 5 grams of proteins and 19 grams of carbs with 0 grams of dietary fiber. What do you think of Pancakes & Sausage Minis - Blueberry? I must say, with the slight discoloration of this product, to my surprise, it was actually pretty good. It doesn't matter what color the skin is, whether it's blue, purple, or even neon green. It's what is in the inside that counts. "I look to a day when food will not be judged by the color of their skin, but by the content of their flavor." This unnatural coloration of the batter tingles my taste buds to a slight uuuguu. It is to my utmost disappointment that I judge this product very harshly. This, greenish-brown color is mostly unappetizing, if not unappetizing completely. An alternative to this banana sundae would probably be Aunt Jemima's famous hard-boiled eggs. The feeling of this mixture of deliciousness encompasses my tongue and brings it to a total ecstasy. 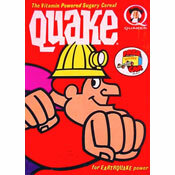 I highly recommend this product for it is worth trying. Five years ago I was left for dead. A couple of mobsters just threw me into a dumpster in the middle of nowhere. But, right next to me was a full box of Pancakes & Sausage Minis - Blueberry. It turned me around. It gave my life direction. So friends, do not buy this product for it will change your life. These do not look good. Saw them in Hershey PA though. Umm... both pictures look gross actually. I'll have to take your word they taste better than they look. Haven't seen them yet in Denver, CO. They look strange by I bet they're good.